I love spinach, especially in curries. One of my favourite side dishes is sag aloo. I have tried many recipes but, until now, have been disappointed. This recipe is not a traditional sag aloo but it is delicious and, for me, is exactly what I want to accompany an Indian meal. Full of nutrients and delicious taste, spinach is a winter superfood. But what’s the best way to eat it? Here are a few tips, courtesy of Care2 website. It’s wiser to choose tender baby spinach leaves. The larger the leaves, the more mature they are and more likely to be tough or stringy. Spinach leaves that are placed under direct light in the stores have been found to contain more nutrients than those stored in darkness. Cooking spinach actually increases its health benefits! Just half a cup of cooked spinach will give you three times as much nutrition as one cup of raw spinach. That’s because the body cannot completely break down and use the nutrients in raw spinach. As an exception to the advice above, research studies show that taking spinach in juice form is actually the healthiest way to consume it. Blend spinach with other vegetables or fruits to create a delicious glass of juice. There’s a compound in spinach called oxalic acid, which blocks the absorption of calcium and iron. An easy way to solve this problem is to pair spinach with a food high in vitamin C.
Well, here is the recipe. Hope you like it. Cook the potatoes in boiling salted water for about 10 minutes or until just tender. Heat the oil in a large non-stick pan or wok and add the fennel seeds and cinnamon stick. Cook for a few seconds then add the onion, garlic and ginger. Fry over a medium heat for about 5 – 10 minutes or until the onion is soft and just turning colour. Reduce the heat to low and add the coriander, cumin, turmeric and chilli powder. Stir fry for about 30 seconds then add the tomatoes. Increase the heat and cook until the tomato juice has evaporated. Cook the spinach as per instruction on packet. Drain and squeeze out excess juice then chop roughly and add to the tomatoes with the potatoes and 200 ml of the potato cooking water. Season with the salt. Mix well and when warmed through, serve. Curry night! Murgh-Saag (Chicken with Spinach) tonight. There are some people who have never tried spinach and think they hate it. I would really encourage you to try this dish. It may just change your mind about spinach for ever! The flavours in this curry are absolutely stunning. I can honestly say it is the best chicken and spinach curry I have ever tasted and I think I am a bit of an expert on such things, as I always choose Chicken Saagwala when we eat out! 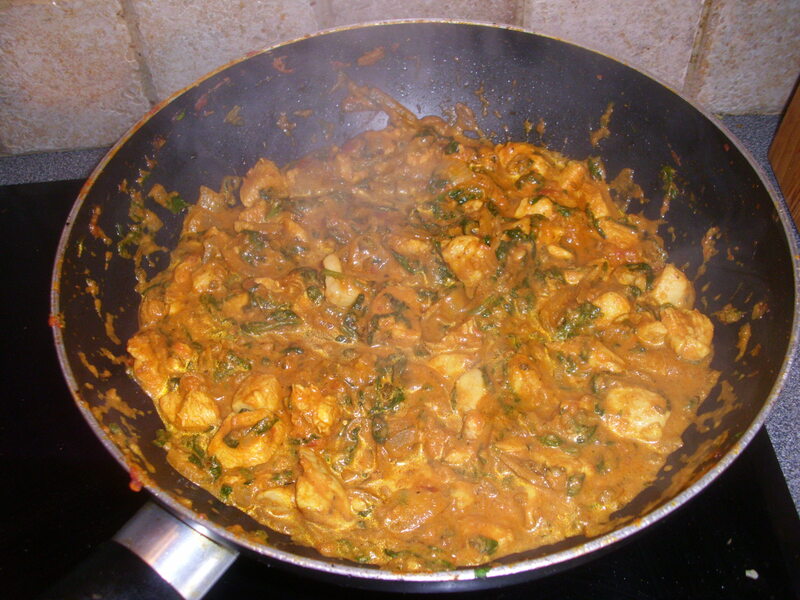 Murgh-Saag is a Punjabi dish, originating from the Punjab region of northwest India and east Pakistan. 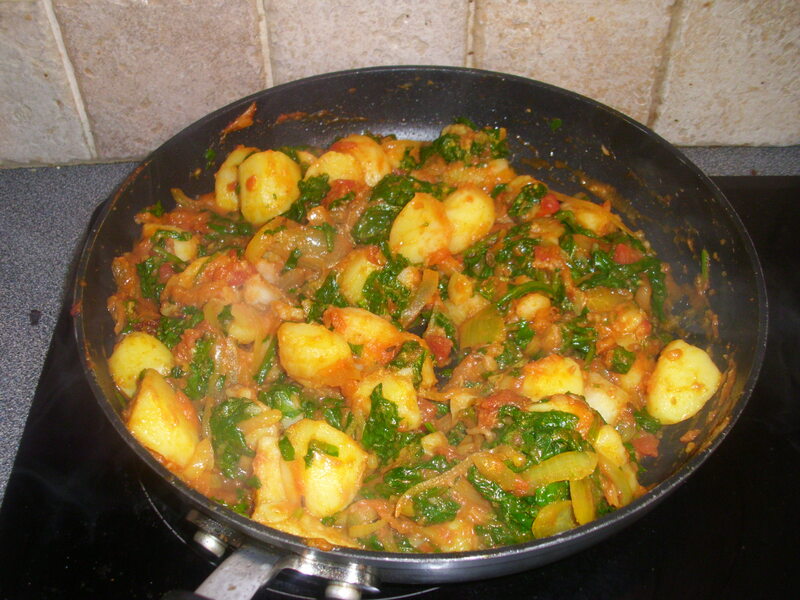 Saag dishes are usually spinach based when bought in the UK. Elsewhere they can be made from mustard leaves. Traditionally Saag dishes are served with Indian breads such as Roti or naan, although some areas prefer to serve it with rice. Some of you may look at this recipe and wonder if it is worth buying all the spices to make it. The initial outlay may be a bit costly but they will last for absolutely ages. Once you have used them you will never want to buy a jar of ready-made curry paste or sauce again! There is just no comparison in the flavours. The best place to buy the spices, if you can, is in an Asian supermarket. They sell them in bags at a fraction of the price you can usually buy them for in supermarkets such as Tesco. start by buying the small bags unless you make lots of curries. They will not go off but the flavour will deteriorate over time. Anyway, here is the recipe. You can make this ahead and warm up the next day (in fact curries usually mature if you leave them in the fridge overnight). It also freezes well. I make enough for four then freeze half for another time. The slideshow starts at Step 2, I forgot to take a picture of step 1. Add the oil to a wok and, when hot but not smoking, add the fennel seeds. Stir fry for 15 seconds then add the onions, reduce the heat to medium, mix well with the fennel then continue to fry for 10 minutes until the onions are soft and just starting to colour. Add the ginger and garlic pastes and stir-fry for 1 minute. Add the tomatoes and stir-fry for 4 minutes more or until all the juice has evaporated. Add the turmeric, coriander and chillies, stir-fry for 1 minute to cook the spices then add the chicken. Mix well and stir-fry for 3 minutes. Add the yogurt and stir-fry for 2-3 minutes more. Pour over the water and add the salt, mix well and simmer for about 5 minutes. Add the spinach, mix well and continue to simmer for 4-5 minutes. Stir in the fenugreek, black pepper and garam masala. Simmer for 2 minutes or until the sauce is thick and the chicken is cooked through. Serve.